A Year of Daily Readings and Reflections. Peace and Freedom in the Here and Now. The Church Guide for Making Decisions Together. Understanding the Teaching of Jesus. (Belief: A Theological Commentary on the Bible series). 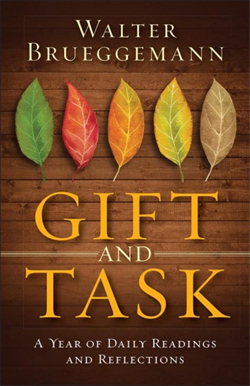 Gift and Task: A Year of Daily Readings and Reflections. Walter Brueggemann. Hbk 376pp. ISBN 9780664263218. Westminister John Knox (2017). $39.00. [Allow 2-3 weeks]. 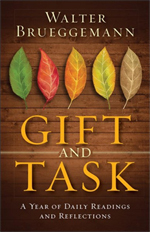 Gift and Task is an original collection of 365 devotions by best-selling author Walter Brueggemann, providing the opportunity to consider in critical ways the cost and joy of discipleship. Perfect for daily use, this book begins with the First Sunday of Advent and provides insightful reflection and thought-provoking commentary on the Scriptures for each day of the year. Brueggemann guides disciples with wisdom and encouragement for our never-ending walk along Gods challenging, grace-filled path throughout the Christian year. The God whom we meet in Scripture is one who gives generous gifts in the wonder of creation, in the miracle of emancipation and reconciliation, and in the surprise of transformation. We are invited to receive those abundant gifts on a daily basis, with a posture of anticipation, awe and gratitude. In response, we accept the worthy task of daily discipleship. The Art of Living: Peace and Freedom in the Here and Now. Thich Nhat Hanh. Hbk 206pp. ISBN 9780062434661. Harperone (2017). $47.50. [Allow 2-3 weeks]. 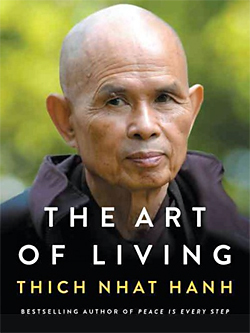 In this important volume, Thich Nhat Hanh — one of the most revered spiritual leaders in the world today — reveals an art of living in mindfulness that helps us answer life’s deepest questions and experience the happiness and freedom we desire. In troubled times, there is an urgency to understand ourselves and our world. We have so many questions, and they tug at us night and day, consciously and unconsciously. He presents seven transformative meditations that open up new perspectives on our lives, our relationships and our interconnectedness with the world around us. Based on the last full talks before his sudden hospitalisation, and drawing on intimate examples from his own life, Thich Nhat Hanh shows us how these seven meditations can free us to live a happy, peaceful and active life, and face aging and dying with curiosity and joy and without fear. This is not an effort to escape life or to dwell in a place of bliss outside of this world. Instead, this path will allow us to discover where we come from and where we are going. And most of all, it will generate happiness, understanding, and love, so we can live deeply in each moment of our life, right where we are. 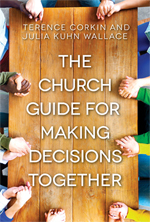 The Church Guide for Making Decisions Together. Terence Corkin; Julia Kuhn Wallace. Pbk 205pp. ISBN 9781501838071. Abingdon Press (2017). $43.00. [Allow 2-3 weeks]. This book on discernment in the church provides a step-by-step guide on how to create a new way of working together. Vital and healthy congregations yearn for collaborative, respectful, encouraging, engaging and empowering decision making processes. Drawing on tried and tested processes, it advocates for a consensus building approach and shows people how it can work in their local setting. Readers will learn how to design a consensus building business process for their church meeting while still respecting the denominational and legal requirements under which they operate. This book is for leaders, members of church boards and committees, and church members who know that there is something wrong with the present system but don’t know what to do about it. The advice offered is hopeful, inspiring and practical. Drawing from over 500 texts in both English and te reo Māori written by Māori women themselves, or expressing their words in the first person, He Reo Wāhine explores the range and diversity of Māori women’s concerns and interests, the many ways in which they engaged with colonial institutions, as well as their understanding and use of the law, legal documents, and the court system. During the 19th century, Māori women produced letters and memoirs, wrote to newspapers and commissioners, appeared before commissions of enquiry, gave evidence in court cases, and went to the Native Land Court to assert their rights. The book both collects those sources – providing readers with substantial excerpts from letters, petitions, submissions and other documents – and interprets them. 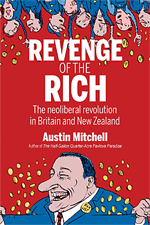 Eight chapters group texts across key themes: land sales, war, land confiscation and compensation, politics, petitions, legal encounters, religion and other private matters. 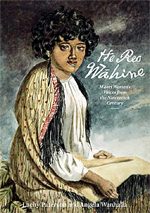 He Reo Wāhine is a bold new introduction to the experience of Māori women in colonial New Zealand through Māori women’s own words – the speeches and evidence, letters and testimonies that they left in the archive. 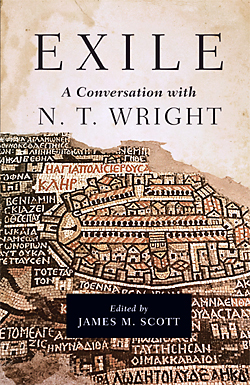 Exile: A Conversation With N. T. Wright. James M. Scott. Hbk 343pp. ISBN 9780830851836. IVP Academic (2017). $69.00. [Allow 2-3 weeks]. Few New Testament scholars of recent decades have set the pitch for academic discussion and debate in their field like N. T. Wright. His signature contention, that Israel’s continuing exile was a pivotal issue in the emergence of Christianity, has found a central place in contemporary New Testament scholarship. While many find this a compelling key to understanding the New Testament, critical responses also abound. This book engages a variety of scholars in conversation with Wright’s thesis. The scene is set in an introduction by James M. Scott, who has made significant contributions to the debate. Then, in a programmatic essay, Wright clearly restates his thesis. Next comes eleven essays from scholars such as Walter Brueggemann, Philip Alexander, Jorn Kiefer, Dorothy Peters, and Scot McKnight. They interact with Wright’s thesis from various perspectives: Hebrew Bible, Septuagint, early Judaism, the Dead Sea Scrolls, and the New Testament. Hans Boersma and Ephraim Radner then engage Wright’s thesis from theological perspectives. Finally, Wright offers a lively response to his interlocutors. 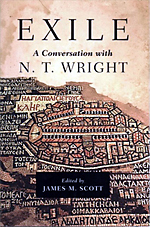 Exile is essential reading for anyone engaged with Wright’s work and the Jewish setting of Jesus and Paul. Mindfulness and Christian Spirituality: Making Space for God. Tim Stead. Pbk 162pp. ISBN 9780664263164. Westminister John Knox (2017). $31.00. [Allow 2-3 weeks]. 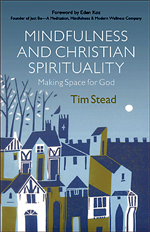 Stead explores how practicing mindfulness can help Christians better live out their faith. He explains what mindfulness is and what is beneficial about it. The spiritual practice of mindfulness has continued to gain popularity throughout the years. But what exactly does this practice offer to Christians? He also reflects on how it can impact what and how we believe and seeks to find how mindfulness enables our Christian faith to work for us. Mindfulness practices that are designed to help readers make space for God in their everyday lives are included. 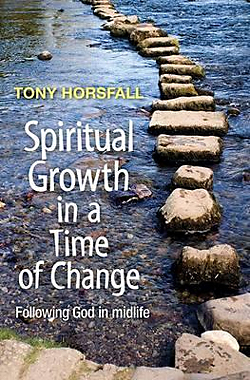 Spiritual Growth in a Time of Change: Following God in Midlife. Tony Horsfall. Pbk 160pp. ISBN 9780857464354. Bible Reading Fellowship (2016). $24.99. [Allow 3-4 weeks]. Midlife – our 40s and 50s – can be some of the most important years of our lives in spiritual terms. They are also times of change, which can include turbulent emotional transitions as we encounter a range of challenging personal issues. 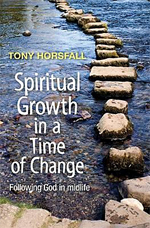 Tony Horsfall not only addresses a number of such issues – from facing up to the past to renegotiating relationships – but explores how to navigate a spiritual journey through these years, leading to deeper faith and a closer walk with God. Love is His Meaning: Understanding the Teaching of Jesus. Keith Ward. Pbk128pp. ISBN 9780281077632. SPCK (2017). $31.00. [Allow 3-4 weeks]. Jesus’ teaching has changed the world. Yet his sayings can often seem cryptic and hard to understand. 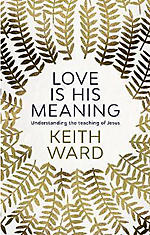 Ward explores the various figures of speech and images that Jesus used, and finds they are all ways of expressing and evoking the self-giving love of God, manifested supremely in Jesus’ life. They communicate spiritual truths, often not in a literal but in a poetic way. They encourage us to take our own moral decisions with sensitivity and care for others. They show that God’s love will never abandon anyone, and that it extends to everyone in the world without exception. And they promise a fulfilment of our hopes for a just and peaceable world that surpasses anything we might describe or imagine. 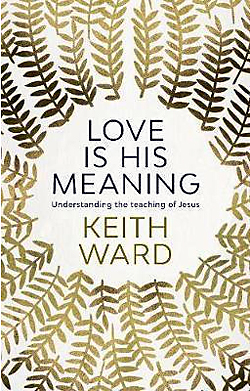 Putting aside literalist, authoritarian, legalistic, judgemental and divisive presentations of Jesus’ teachings, the author shows that what remains is the gospel of a divine love – a love stronger than death, and the only power that can and will redeem our disordered world. 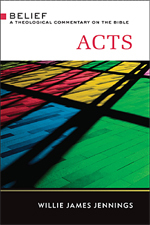 Acts (Belief: A Theological Commentary on the Bible series). Willie James Jennings. Hbk 289pp. ISBN 9780664234003. Westminister John Knox (2017). $67.00. [Allow 2-3 weeks]. Theologian Willie James Jennings explores the relevance of the book of Acts for the struggles of today. While some see Acts as the story of the founding of the Christian church, Jennings argues that it is so much more, depicting revolution—life in the disrupting presence of the Spirit of God. According to Jennings, Acts is like Genesis, revealing a God who is moving over the land, “putting into place a holy repetition that speaks of the willingness of God to invade our every day and our every moment.” He reminds us that Acts took place in a time of Empire, when the people were caught between diaspora Israel and the Empire of Rome. The spirit of God intervened, offering new life to both. 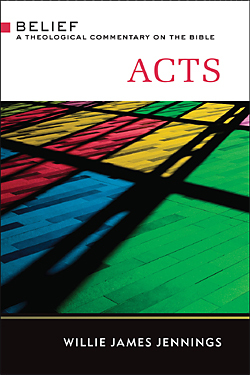 Jennings shows that Acts teaches how people of faith can yield to the Spirit to overcome the divisions of our present world. Take This Bread: A Radical Conversion. Sara Miles. Pbk 294pp. ISBN 9780345495792. Ballantine Books (2008). $34.00. [Allow 2-3 weeks]. 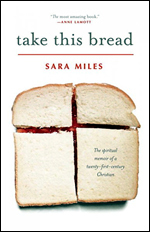 Early one morning, for no earthly reason, Sara Miles, raised an atheist, wandered into a church, received communion, and found herself transformed-embracing a faith she’d once scorned. A lesbian left-wing journalist who’d covered revolutions around the world, Miles didn’t discover a religion that was about angels or good behaviour or piety – her faith centred on real hunger, real food, and real bodies. Before long, she turned the bread she ate at communion into tons of groceries, piled on the church’s altar to be given away. Within a few years, she and the people she served had started nearly a dozen food pantries in the poorest parts of their city. Here, in this achingly beautiful, passionate book, is the living communion of Christ. City of God: Faith in the Streets. Sara Miles. Pbk 205pp. ISBN 9781455547302. Jericho Books (2015).$32.50. [Allow 3-4 weeks]. 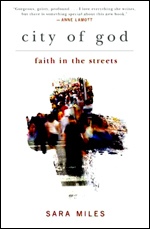 A powerful account of venturing beyond the borders of religion into the unpredictable territory of faith. On Ash Wednesday, 2012, Sara Miles and her friends left their church buildings and carried ashes to the buzzing city streets: the crowded dollar stores, beauty shops, hospital waiting rooms, street corners and fast-food joints of her neighbourhood. They marked the foreheads of neighbours and strangers, sharing blessings with waitresses and drunks, believers and doubters alike. City Of God narrates the events of the day in vivid detail, exploring the profound implications of touching strangers with a reminder of common mortality. 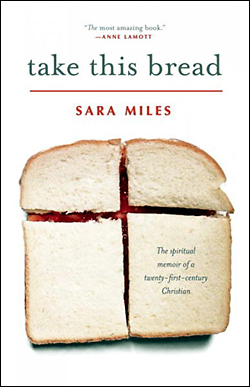 As the story unfolds, Sara Miles also reflects on life in her city over the last two decades, where the people of God suffer and rejoice, building community amid the grit and beauty of this urban landscape. This is a beautifully written personal narrative, rich in complex, real-life characters, and full of the “wild, funny, joyful, raucous, reverent” moments of struggle and faith that have made Miles one of the most enthralling Christian writers of our time.